For weeks now, the media have exhaustively referenced those "16 words" from President Bush's State of the Union Address. Why the number of words seems so important is unclear, unless one takes it as a subtle allusion to the "18 1/2 minutes" that helped bring down Richard Nixon. Regardless, a large segment of the American population has become convinced that there was something highly controversial in the following statement from the president's speech: "The British government has learned that Saddam Hussein recently sought significant quantities of uranium from Africa." The fact that the British government continues to say it has proof that Saddam Hussein recently sought significant quantities of uranium from Africa has done nothing to quell the enthusiasm of Bush's detractors. Democrat presidential candidates are stepping all over each other to be heard accusing Bush of "deliberate misrepresentation," and other things that sound a lot like lies, without actually using the word. Florida senator and Democrat presidential candidate Bob Graham added, "I would not use the three-letter word, 'lie.' I would use the five-letter word, 'deceit.'" Needless to say, if Graham were a Republican, he would be getting Quayled every day in the press for that bit of creative ciphering. The news media, desperate to place the words "Bush" and "lie" in the same sentence, but unwilling to make the charge themselves, have printed headlines and captions saying things like "Bush WMD 'lies'?" In one story about this manufactured controversy, CNN Headline News showed a slide of Vice President Cheney, with the caption, "Pushed False Uranium Claim?" The people at CNN know as well as anybody that the statement Bush made in his address was not false ... but then, they were not saying it was. They were simply pointing out that others might have been asking the question. Or at least, that's the sort of weasely distinction that could be used to justify the circulation of such a baseless accusation. To his critics' delight, Bush backpedaled, as if he thought they would meet him halfway if only he apologized first. The administration conceded that the uranium statement, for some reason or other, should not have been in the president's address. Defense Secretary Donald Rumsfeld made the rounds on the Sunday news shows, where he alternately defended his boss by pointing out that none of the now infamous "16 words" was false, and sheepishly offered the Clintonian explanation that those words "did not rise to the level of a presidential speech." While the statement is actually true, he explained, there was not enough corroboration from American intelligence to justify its presence in the address. The press did not pick up on that nuance. Instead, they concluded that if Bush had been accused of lying in his speech, and later admitted that he shouldn't have made the controversial statement, then he is admitting that he lied. In a July 9th column, Time magazine columnist Tony Karon took it like this: "The question is no longer whether the President uttered a falsehood in his indictment of Iraq; it's at what point the administration learned the claim of uranium purchases from Niger was false." Now, accusing somebody of lying is a serious matter, so let's give Karon the benefit of the doubt, and assume that he just doesn't know what in blue blazes he's talking about. Nowhere in his column did he illustrate that anything in Bush's address was false. Furthermore, the president made no mention of Niger at all. So where does that accusation come from? Did he say it with his eyes? Since we're only concerning ourselves with 16 words, it ought to be simple for everyone to acknowledge just which words those are. It's easy to see how Karon could be so mistaken, though, since he based his opinion in part on a pair of completely contradictory statements made by Ari Fleischer. The White House press secretary explained Bush's true but somehow wrongly made statement by saying it was "predicated on" a falsified document purporting to show that Saddam had bought uranium from Niger, but that "I see nothing that goes broader that would indicate that there was no basis for the president's broader statement." Fleischer even mistakenly attributed the Niger hoax to the British, who say that it was not among the evidence they've obtained. It's no wonder that some people think Bush made a false statement, when his own spokesman has made a false statement in support of the charge that he did. That said, the administration's poor attempts at explaining itself do not excuse journalists of their responsibility. If Tony Karon is going to write that there's no question Bush "uttered a falsehood" in his State of the Union Address, then he should be able to quote the statement, and point out why it's false. Those fraudulent Niger documents, according to a July 19th Reuters story, were given directly by an Italian reporter named Elisabetta Burba to the U.S. embassy in Rome. Burba did not give that same information to the British. It makes no sense to assume that Bush attributed to the British government the contents of papers the U.S. government had but Britain likely would not have gotten from any source other than the U.S.. Nevertheless, media analysts have been quick to assume that whatever evidence our allies have acquired must consist of the discredited Niger papers, and nothing more. President Bush's enemies are misinterpreting his words so that they can then extrapolate them into the charge that he led America into war "under false pretenses," as Democrat senators Bob Graham, Ted Kennedy and Carl Levin like to say. This means not only that a single piece of evidence was unreliable, but that Bush's entire argument that Saddam had weapons of mass destruction, and that he could provide those weapons to terrorists, was a lie. It also means the president's address, given on January 29th, 2003, somehow "misled" Congress into the decision to go to war three and a half months earlier. The Authorization for Use of Military Force Against Iraq Resolution of 2002, passed by the Senate on October 11th of that year, declared in Section 3 that, "The President is authorized to use the Armed Forces of the United States as he determines to be necessary and appropriate in order to -- (1) defend the national security of the United States against the continuing threat posed by Iraq and (2) enforce all relevant United Nations Security Council resolutions regarding Iraq." Senators Graham, Kennedy and Levin, all of whom voted against the resolution, now claim that its passage was based on the "false pretenses" Bush allegedly laid out in the State of the Union Address, more than eleven weeks later. Largely ignored throughout this racket has been the mounting evidence of Saddam's chemical, biological and nuclear weapons programs. In December, our maligned intelligence sources warned us that the Iraqi madman was ordering government officials to conceal components of his arsenal in their homes and on their property. This modus operandi was confirmed last month, when Iraqi scientist Mahdi Obeidi produced documents and nuclear weapons components he'd had buried in his yard. That revelation went a long way toward explaining why weapons searches had turned up so little to that point. Obviously, if Saddam had hidden his weapons at private residences, finding them would be a tedious process that would require a great deal of patience. The materials found in the scientist's yard, however, had been there since the '91 Gulf War. Therefore, the spin from Bush's opponents was that there was still no "smoking gun" that indicated that Saddam's weapons programs had been recently active. Such was also the argument in January, when inspectors discovered eleven warheads specifically designed to deliver chemical weapons. Oh ... those old things, the Iraqi government explained. They'd been forgotten for so long that they'd been mistakenly omitted from that 12,000-page report that said all the weapons had been destroyed. Surely, there was no intent to use them at any time in the future. Besides, the warheads were empty. It wouldn't be fair to consider them a "smoking gun" when they weren't even loaded. Remember that inspectors weren't sent to look for a "smoking gun." What they were supposed to look out for was any "material breach" of U.N. Resolution 1441, which both the missiles and the buried nuclear components clearly were. Once material breaches were found, though, the standard of proof became the metaphoric "smoking gun," which is impossible to objectively define. Once the deliberately incompetent U.N. chief weapons inspector Hans Blix embraced the new terminology, the media took their cue, and seldom since then has Resolution 1441 even been considered relevant. There are certain journalists, foreign diplomats, and members of the demagogic wing of the Democratic Party who would never admit the war was justified, even if we found a 10,000-gallon drum marked "anthrax," with a skull and crossbones on the side. Their denials are predetermined. Since they opposed the invasion, they are certain that there are no weapons of mass destruction, because their position demands that there mustn't be. So when George Bush and Tony Blair say there are, they must be lying. This determination to deny any evidence can be seen in the almost total lack of reaction to Tom Brokaw's recent interview with Pentagon weapons inspector David Kay. In that July 15th broadcast of "NBC Nightly News," Kay explained that Iraqi citizens have been helping the U.S. locate and gather documentation of Saddam's WMD programs, and that the information is abundant, detailed and comprehensive. "I think that six months from now, we'll have a considerable amount of evidence, and we'll be starting to reveal that evidence." Brokaw asked him, "What's the strongest case that you'll be able to make -- is it the biological, chemical or nuclear?" Kay's answer: "I think we will have a very strong case on all of those." Later in that interview, he said that "a big chunk of [the documentation] deals with foreign procurement. ... Every WMD program in this country has always had large elements of foreign procurement. So we're finding purchasing records that tell us what they imported. Also, they were assiduous as record-keepers, so we're finding progress reports. They also got financial rewards from Saddam Hussein by indicating breakthroughs. They actually went to Saddam and said we have made this progress. Their records -- their audio tapes of those interviews give us that." It sure sounds like there's a lot more involved here than a single, fraudulent document that fell into the hands of an Italian journalist. 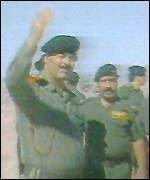 In reference to two trailers full of material that Saddam's men left behind, Kay said, "These documents have extreme value. They relate to the program that the Iraqis used to hide their weapons program from international inspectors over twelve years." According to our chief weapons inspector, not only do we have evidence of the existence of Saddam's weapons program, but we also have proof of his systematic evasion of those U.N. inspectors whom the anti-Bushies say just needed a little more time to finish the job. How can those in the "Bush Lied" chorus possibly explain this? Perhaps they'll argue that every single scrap of the documentation is forged, including the tapes. Maybe they'll say that they were all produced years and years ago, and that Saddam would have gladly handed them over to inspectors, if only he'd known he still had them. Or will they simply not believe any of it until they hear it from Hans Blix, since David Kay, being a Pentagon weapons inspector, must be taking his marching orders from a bunch of dastardly neoconservatives? They haven't had to decide yet, because nobody is asking them. Few people are even aware of the Brokaw-Kay interview, because there has been almost no reporting on it in the two weeks since. The fictitious tale of the president's "false uranium claims" continues to make the news on a daily basis, whereas the real news about our efforts to find Saddam's real weapons has been forgotten like yesterday's baseball scores. Even NBC hasn't followed up on it. On MSNBC.com, a search using the keywords "david kay" produces only two results, one of them being the Brokaw interview, and the other a page containing a brief profile of Kay and former UNSCOM inspector Richard Butler. By comparison, a search using the keywords "kobe bryant" yields 85 results. Brokaw described Kay's evidence to his viewers by saying, "This is a mother lode, an estimated seven and a half miles of documents, many of them collected by the U.S. military from official buildings, but many others handed over by Iraqi civilians." But this mother lode remains buried ... beneath that other load -- that stinking heap of waste that has been churned forth by the lazy minds and overactive spleens of President Bush's enemies.